Please call (415) 664-8331 to reserve your space. We look forward to meeting you! School starts for all students at 8:00 AM every morning. Kindergarten is dismissed at 2:30 PM Monday through Friday. Grades one through eight are dismissed at 2:30 PM on Monday and 2:50 PM Tuesday through Friday. On minimum days (in-services, faculty meetings, etc.) , school is scheduled from 8:00 AM until 12:15 PM for all students. We average 35 students per grade. Our experienced and energetic teachers have excellent classroom management skills which allow all our students to succeed. Recognizing the value of additional support staff to enhance education, we have aides in Grades Kindergarten, First, Second, Third, Fourth, Fifth, Sixth, Seventh and Eighth. For all our students, we provide specialized teachers in Math, Science, Technology, Spanish, Physical Education and Music. We have committed after-school teacher support in Technology and Math. Six teachers, departmentalized by their areas of expertise, teach our Fifth, Sixth, Seventh and Eighth Graders. In addition, our Learning Resource Specialist collaborates with our classroom teachers to ensure all students become successful learners. For 2018-19, tuition for one student whose parents meet participation requirements and who are registered, contributing members of Saint Stephen Parish is $7,710. Committed to providing an affordable Catholic education to all our families, we offer discounted tuition for siblings. Each family pays tuition online via the FACTS Tuition Management System. Parents may elect to pay the tuition in full at the beginning of the school year, at the beginning of each semester, or on a monthly basis. Yes, Extended Care (EC) is available after school. The program operates five days a week from dismissal until 5:50 p.m.
Our EC provides a comprehensive after school program in a safe and secure environment. Students can complete homework inside EC in a quiet space conducive to studying. EC staff supervises and coordinate art projects in the Art Room, sports in the schoolyard, and group games. Once enrolled by completing an application and paying a $50.00 registration fee, a family may use the program on a regular, full time or a drop-in basis. Families may pay a yearly rate of $2,000 or a drop in hourly rate of $5.00 per hour for EC. Parents whose children use the service are billed monthly. Does the school offer hot lunch? Yes, we offer our hot lunch program five days a week. The daily lunch includes fruits and vegetables to encourage healthy habits. Students may purchase lunch every day or only on select days. How many new students will be accepted? In the last few years, we have enrolled approximately 35 students in our kindergarten. 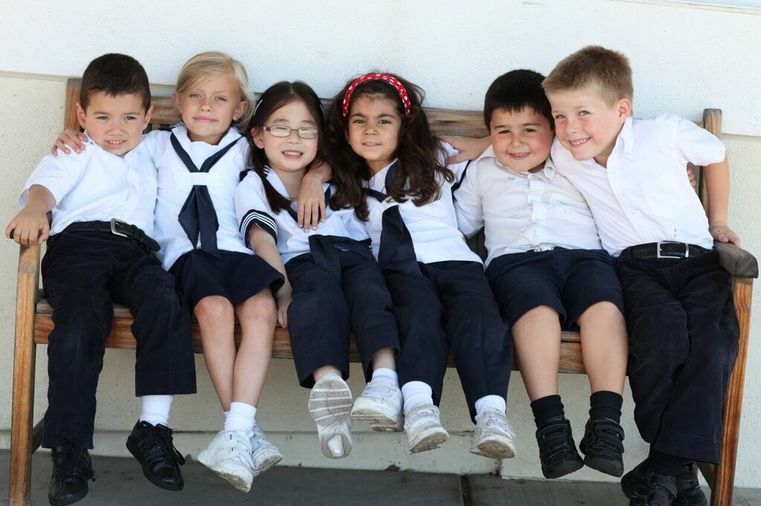 Based on our parent survey, we expect that half the kindergarten enrollment next year will be made up of brothers and sisters of current St. Stephen School students. We have receive many requests for enrollment information both from families currently part of the St. Stephen School community and new families. We do not have many openings in other grades. However, we expect we will enroll approximately ten new students this year for grades one to seven. What documents must we submit to apply to Kindergarten? When does the school make decisions regarding Kindergarten Acceptance? After the Kindergarten Screening, we will begin making acceptance decisions by the end of January. What documents must we submit to apply to Grades 1-7? When will the School notify us about the status of our application to Grades 1-7? When we complete our current students’ re-registration process, (no later than April 1st), we will begin accepting students for grades one through seven to fill any openings we have. We will provide a deadline, approximately one week, to submit the appropriate fees to hold your child’s place. These fees are non-refundable. If you change your mind and do not send your child to the school for any reason, the fees are still non-refundable. If the office does not receive the fees to hold your child’s place by the stated deadline, we can no longer hold the space and will offer it to another applicant. Due to the number of applicants, we may place some children on our wait list. Our experience has been that openings develop even up to the beginning of the school year. When that happens, we reconsider all the applicants on our waiting list. We will contact wait listed families as soon as possible when spaces becomes available. Why should we choose St. Stephen School for our child(ren)? St. Stephen School is a dynamic, diverse and integral part of Saint Stephen Parish. Founded in 1952, we have a tradition of excellence in educating children in a faith-filled, supportive and nurturing environment. Our school motto “Treat each other with kindness and respect”, reflected in all that we say and do, instills and fosters in our students compassion, inclusivity, and empathy. We truly value our close-knit, enthusiastic community, comprised of parents and parishioners, who generously support the children of St. Stephen School. Our parents serve as leaders on our on school boards, coach CYO teams, volunteer at and attend both our fundraisers and friendrairsers, including our Family Bingo Night, Annual Auction, Easter Egg Hunt, and Grandparents Day. They chair our daily hot lunch program, provide yard duty, and chaperone our field trips. Our parents’ energy, expertise and wisdom enrich and improve the lives of our students.